Eating breakfast with my parents this morning and I was trying to be lighthearted about the whole "I'm Going To Die Alone" thing, when my father decided to be funny. MamaEldritch: You just aren't trying. Who are you going to find if you spend all your time in your room? Me: Mom, no offense, but I have so little prospects that Benedict Cumberbatch himself could fall through my ceiling and I'd still have zero chance. DaddyEldritch: *laughs to himself* Like the hag in Robin Hood: Men In Tights! DaddyEldritch: You're like the hag in Robin Hood: Men in Tights! The Sheriff of Nottingham falls into her bedroom and she's like "my prayers are answered!" because she's a magical hag. 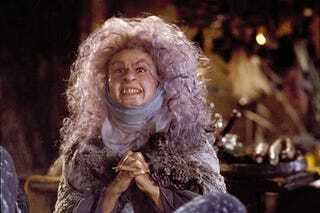 Me: ....................did you just call me a magical hag? DaddyEldritch: ....um... You know what, I have some errands to run? See you later!